Capt. 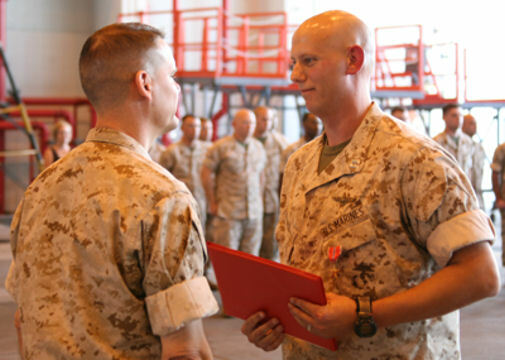 Jason H. Dale, a forward air controller with Marine Aerial Refueler Transport Squadron 252, was awarded a Bronze Star with a combat distinguishing device at the VMGR- 252 hangar, Sept. 9. The 37-year old was recognized for his achievements in connection with combat operations while serving as a forward air controller with Alpha Company, Battalion Landing Team, 1st Battalion, 6th Marines, 24th Marine Expeditionary Unit, II Marine Expeditionary Force, International Security Assistance Force, Garmsir District, Helmand Province, Afghanistan, in support of Operation Azada Wosa from April 1 to Aug. 20, 2008. According to his award citation, Dale's calm demeanor under fire and relentless pursuit to employ supporting aircraft on the battlefield were critical to the success of the company during the operation. During the operation, Dale oversaw 42 combat controls where he was instrumental in employing 181 2.75-inch rockets, 15 Hellfire missiles, two TOW missiles, eight GBU-38 and five GBU-12 laser-guided bombs, one GBU-32 Joint Direct Attack Munition, and numerous helicopter and aircraft gun runs. Also, on 12 separate occasions Dale called for and directed casualty evacuation aircraft, resulting in the timely evacuation of 16 wounded Marines. Dale spoke briefly after receiving his award and recognized the efforts of the entire squadron. Dale also took time to thank the Alpha Company leathernecks he had served with in combat.